Mitch Kessler, teenage high school dropout, jobless and mostly friendless, lives a life of solitude, but not by choice. Endowed with the ability to bring wings out of his body as well as claws, and transform himself into a fierce creature of the night, he’s picked up a nickname from the general public that he hates: gargoyle. However, that’s the least of his worries. His girlfriend, Callie, can’t keep her genders straight, his best friend is a spinning top, and his other acquaintance is made of rock. It’s obviously a government plot, but Mitch doesn’t know who’s behind it or why. Worse, various and sundry creations have now appeared out of the woodwork and are out to kill him. 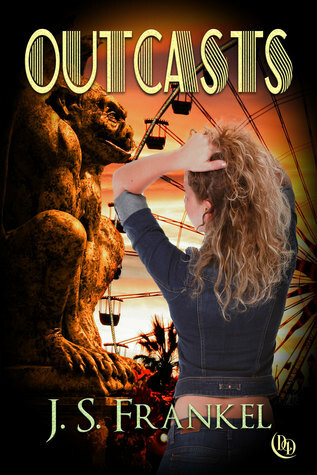 Aided by his friends, the four outcasts attempt to find out who’s running the show. They’re out to stop the forces of evil before they can do more damage. That is, if they survive. Mitch is different. He can change into a creature that looks like a gargoyle. Since he had his first change, Mitch was outcast by everyone, except his mother. But he’s not alone, his best friend Joe is a spinning top, his girlfriend Callie can’t keep his/her gender and switches from male to female, and Neil is made of rock. They try to be normal, to have a normal life, but people don’t trust them, they fear them and want to chase them out of their town, and worse, some weird creatures/monsters, try to kill them. How do you live like an average teenager when you’re not? That’s what Mitch and his friends will have to figure out, if they survive. Mitch lives with his mother, spent all his free time with his best friend Joe and wants to be the new quarterback of his football team. But suddenly, he changes into a creature of the night with claws and wings, and his face changes into a kind of monster face with red eyes, and his life changes forever. Joe is Mitch’s best friend; he also changes with him. He’s a human spinning top, he has a fast metabolism too, and he’s a great support for Mitch when they don’t argue. Callie is born Cal. She’s born male, but she’s always felt like a girl. At sixteen, Cal changes and becomes Callie… without any treatment or surgery. Like Mitch can fly, Callie can change her gender. Great! You’d think she can finally be who she truly is, but nope, because Callie can’t keep her gender straight and can’t control her change. Neil is the rock man. He has a human face with a rock body. Yep, rocks, stones, he eats them too. I had a good moment with these four outcasts. I liked it a lot. The author doesn’t write a story with super-mutants against super-villain with a lot of explosions and epic battles. In this book, we follow them, especially Mitch who tries to have a normal life. How he’s judged, excluded, and mistreated by people. How those kids are cast out. The plot is focused on Mitch and his team, and the government’s conspiracy against them in the background. I love the way the author, with this story, treated the difficult subject of the exclusion. How people can judge you, how they can hurt you because you’re different. Callie’s character express what transgender people must be feeling every day. I really like all the messages that the author put in his book. I recommend this book for you but also for your young ones. 4 OptimuMM’s for this band of misfits.